This article originally appeared on Worn & Wound. It has been reprinted here with permission. Words by Hung Doan. There will come a time when you will need to keep a watch in storage. It may be a watch you rarely wear, a speculative purchase waiting to be flipped, or one that you’re simply saving to pass on to the next generation. My eight-year-old son will get my full-size Omega Seamaster Professional when he comes of age, but until then it’s stored away, safe and sound. Having recently packed that watch away, I thought it would be informative to go over the do’s and don’ts of long-term watch storage. 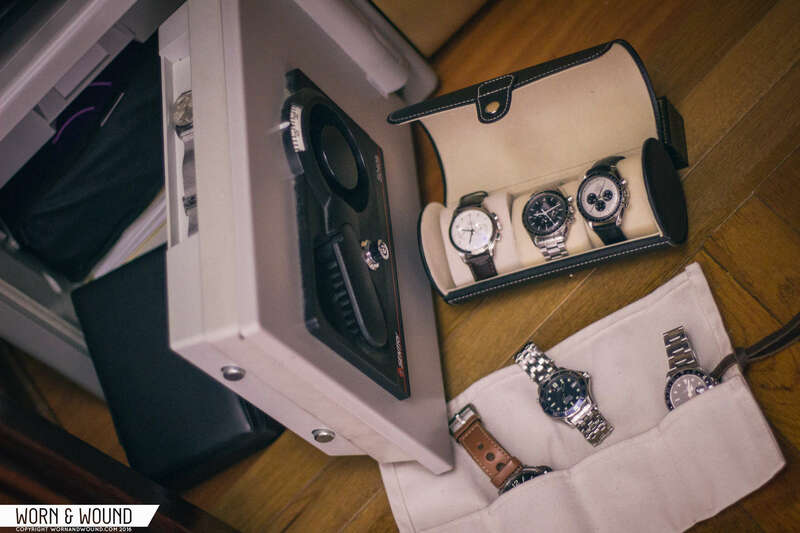 There are several ways to go about storing your precious watches, from putting them in a bank deposit box or keeping them in a safe at home, to packing them away in a box in the garage. 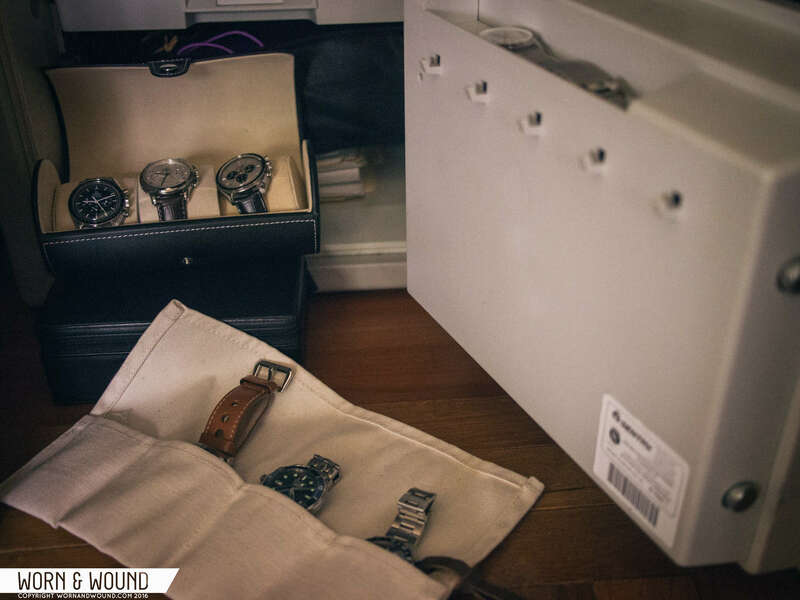 However you decide to store your watches, the following suggestions apply. Ideally, watches should be stored in a temperature controlled setting like a safe deposit box or in a secure home safe. But regardless of where they end up, moisture will be a natural enemy of your watches. This is especially true in a cold safe, where moisture and condensation can damage a watch as oils coagulate and lose their lubricating properties. 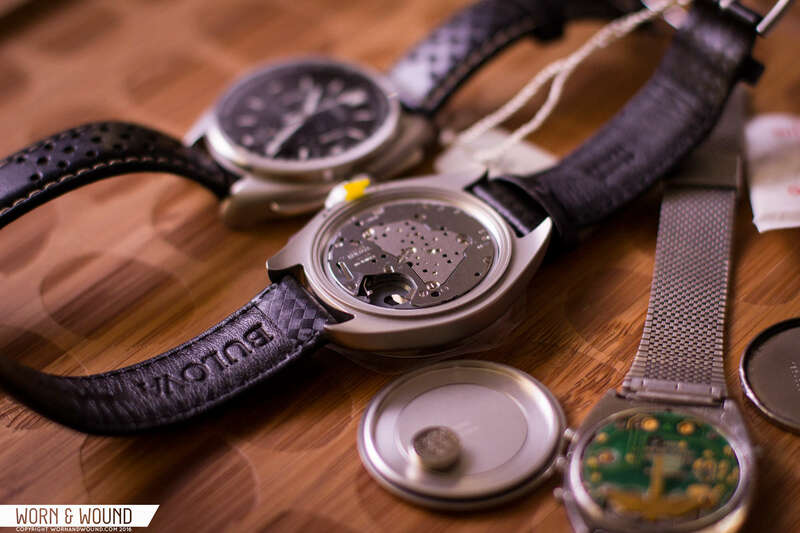 For quartz watches, condensation can be especially damaging to the IC circuits. To combat the effects of moisture, I recommend storing watches with silica gel, a tip passed on to me by gun owners over the years. It is advice I’ve religiously followed for two decades. 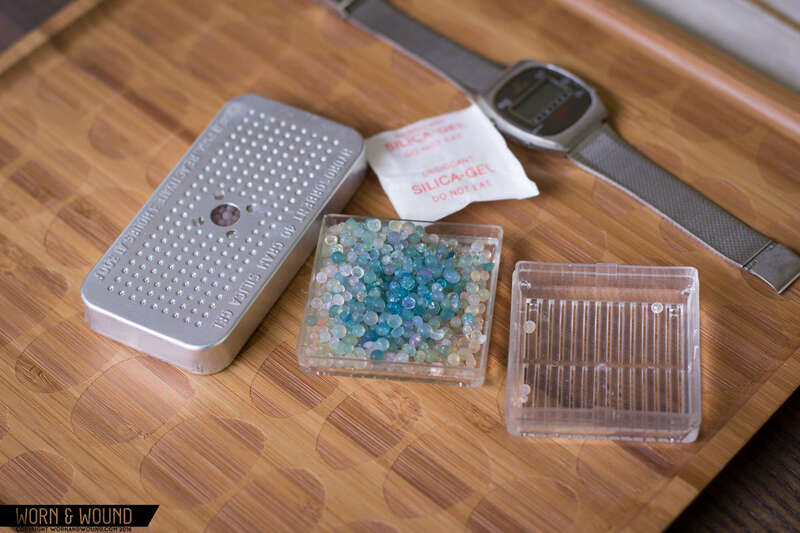 You can buy silica gel in bulk or recycle the packets that come with practically all electronic gear. My personal recommendation is to get the desiccant gel packets that change color as they soak up moisture. Often, they come in blue. As the moisture builds up the colors change to white or pink, indicating they need to be recharged or replaced. Boxes, accessories and paperwork are rather easy to store, and worth keeping around for when you decide to sell your watch (“box and papers” can add considerable value to a sale). You should consider storing them in separate locations as boxes can take up considerable space. With paperwork, however, I keep the warranty cards, authenticity certificates and proofs of purchase along with other important documents in the safe. You should separate everything in their own dedicated zip-lock or protective bags. Moisture can also cause damage to warranty cards and other accessories. Below is an example of two Omega leatherette warranty card holders. Over a 20-year period, the one on the left deteriorated and transferred paint onto the accompanying documents. 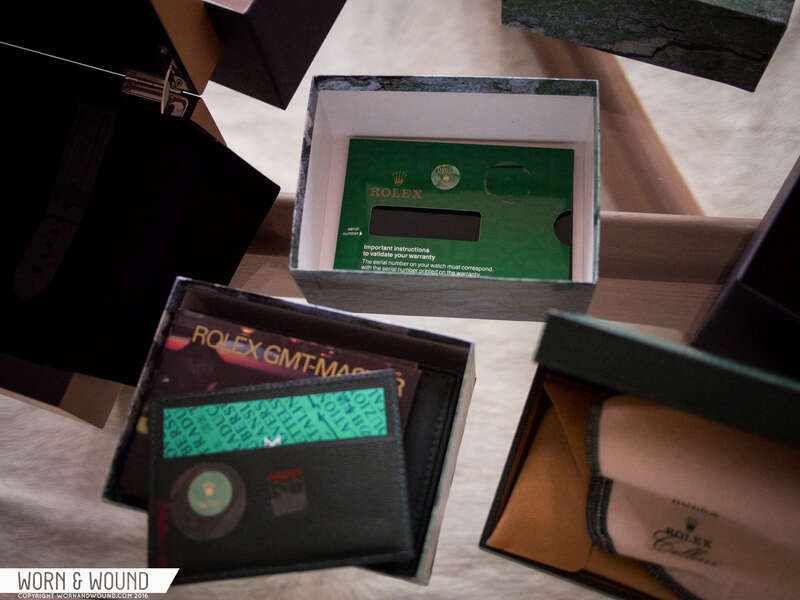 A separate zip-lock bag, as well as some silica gel, would have preserved the dealer calendar cards and manual. A DAMAGED WARRANTY LEATHER HOLDER WITH PAINT TRANSFER ON THE DOCUMENTS I LEFT INSIDE. ZIP-LOCKED HANGTAGS, BRACELETS, STRAPS, ACCESSORIES AND EXTRA LINKS. Some homeowners and rental insurance policies offer blanket coverage up to a certain amount. If this applies to you, definitely take advantage of your coverage. In some scenarios, you may opt to have dedicated coverage. Either way, it is strongly recommended you appraise your watches, especially the vintage ones. For current watches, you should keep track of market pricing as insurance companies will offer a replacement according to market value. 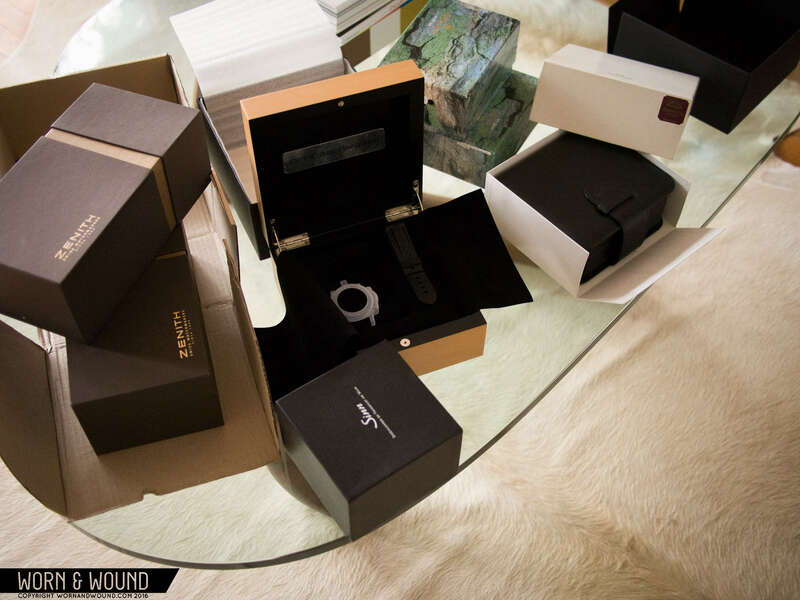 When insuring my watches, I take photographs of everything–boxes, documents, and the watch itself at various angles to indicate condition. In scenarios where I’ve purchased watches from other collectors or through non-traditional channels, I provided scanned magazine reviews, catalogs and price lists to support the stated value. In the 1990s, for example, my Sinn 156 Military was unavailable through official US retail channels, so I used a Bell & Ross (B&R sold co-branded Sinn watches early in their life) price list and scanned copies of reviews from Watch Time to secure my coverage value. APPRAISAL FOR MY SINN 156 USING A WATCH TIME REVIEW AND A B&R PRICE LIST FROM 2001. SAMPLE APPRAISAL FROM A THIRD-PARTY JEWELER. As I noted above, boxes take up a lot of space, but keeping them is paramount in maintaining value. Finding a replacement box on eBay isn’t difficult for brands like Rolex and Omega, but they can cost you $100-300 a pop so holding on to the original is worth it from a monetary standpoint alone. For smaller brands, finding a readily available replacement may not be so easy, so it is important to keep track of what boxes go with what watch (and era, as manufacturers often alter their presentation boxes). As a buyer, you should do your due diligence and research beforehand to make sure that you’re getting the appropriate boxes with your watch. Mechanical watches have their own set of hazards. As oils dry, a movement can freeze. 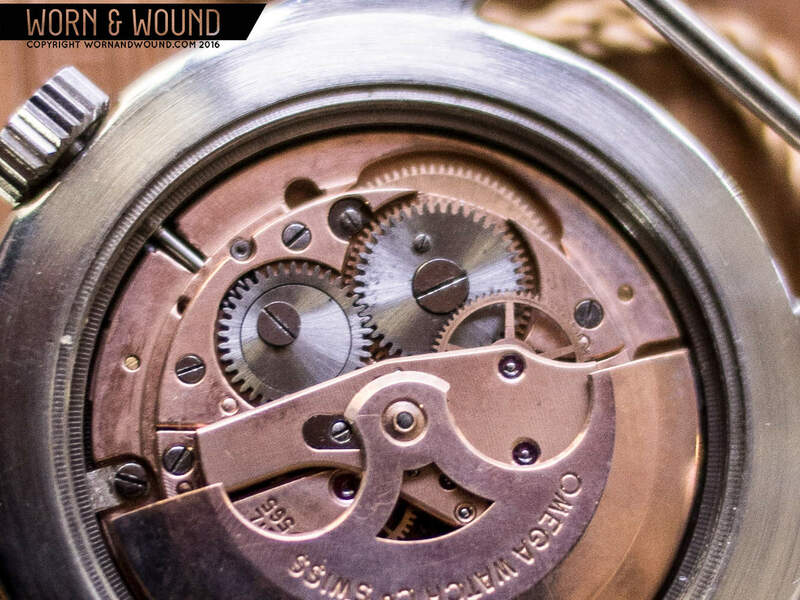 That is why it is often recommended that mechanical watches are wound and worn periodically. However, there is no escaping the fact that oils will need to be replaced. Even unworn watches will need to be sent in for eventual service. If you have a speculative watch you plan to flip in 10 or 20 years, you may forgo service and inform future buyers of the situation, as some would prefer NOS (New Old Stock) status. OMEGA CAL. 565 MOVEMENT FROZEN WITH DRY OILS. Since the late ’90s, many companies have heavily invested in lubrication R&D. Rolex and Seiko especially have been pioneers in this regard. My dad used to tell me, “change the oil in your car every 3,000 miles and service your watch every three years.” This no longer applies. Just like with cars, there are now synthetic oils that significantly increase maintenance intervals. When Rolex first announced their new oils, there was speculation with regard to how long watches could go without service. Now in 2016, the recommended interval for watches manufactured after 2015 is a whopping 10 years. For mechanical watches, I recommend getting a tool like a timegrapher. 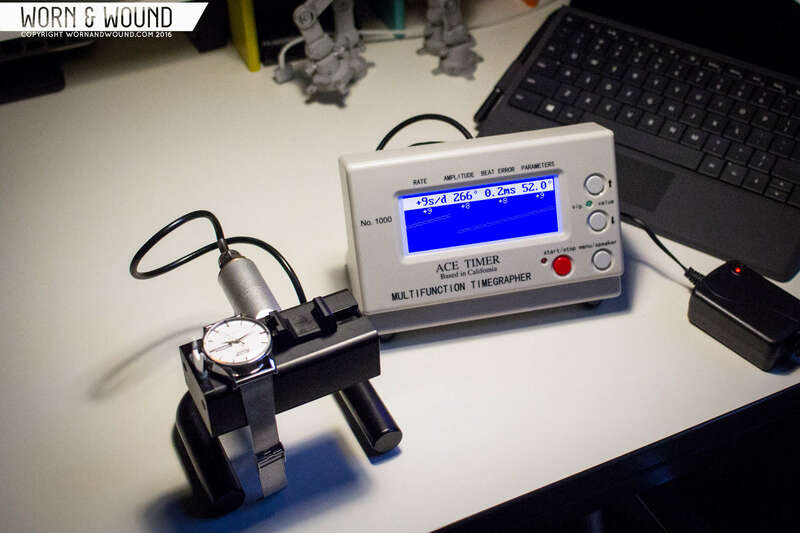 In addition to measuring accuracy, timegraphers offer a snapshot of the health of your watch (a low amplitude or high beat rate can be a sign of mechanical failure). For example, with most modern ETAs, anything under 250 amplitude means your watch should be taken in for service. With some watches, catching this early could mean saving hundreds of dollars in overhaul fees. There are many approaches you can take toward storing your watches and this write-up provides a good primer. There is no one absolute way to store your watches, but whatever you do, keep in mind the key points I wrote about above regarding temperature and moisture, general maintenance, and diligent record keeping. You may not plan to store a watch for 10 to 20 years, but my recommendations are practical even for short term storage. This entry was posted in Watches and tagged watch storage, watches by Styleforum Editors. Bookmark the permalink.